Use C++Builder 10.2 to control audio volume of iOS. I used the MPVolumeView class of iOS. The MPVolumeView class is declared in “iOSapi.MediaPlayer.hpp”. Arrange “Up” and “Down” two TButton. Use this button to control the volume. Add “_di_MPVolumeView” and “_di_UISlider” to the form class. 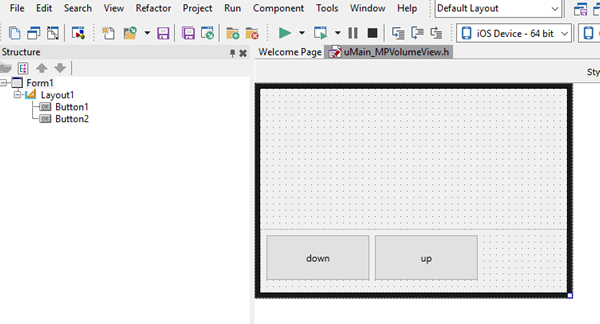 //Use "TMPVolumeView" to create "_di_MPVolumeView". //Setting the _di_UISlider in the "MPVolumeView1". //Set the slider to 0.0.